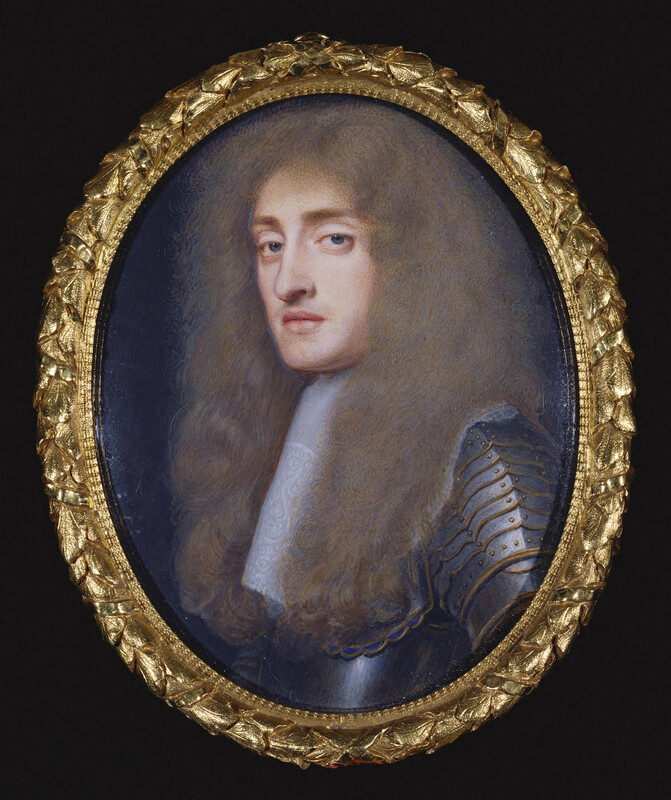 James, Duke of York, later James II, was painted a number of times by Samuel Cooper and this miniature falls midway in the chronology of this group of portraits. The earliest, and one of the finest miniatures by Samuel Cooper, is dated 1661 (Victoria and Albert Museum, London, P45-1955) and appears to pre-date the present miniature by several years. A later miniature (National Maritime Museum) bears a truncated date establishing that it was painted in the 1670s. It follows that the Royal Collection miniature must date from c. 1665. The miniature is an example of Cooper's searching characterisation. The muted tones of the periwig and the armour, relieved only by a glancing highlight on the left shoulder, focus attention on the contrasting chalky features of the Duke of York. Signed on the left in brown: 'SC' (monogram).